I teach English in the south of France. 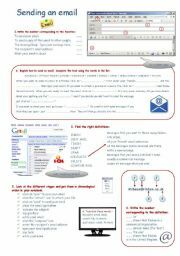 A worksheet to help students prepare an oral presentation. (me, my tastes, my hobbies, my school life, my future job, my relationships with other people...). The layout is a bit changed on the preview, but it should be ok when you download it. 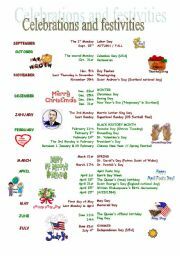 How to write the date: days, months, ordinals, seasons, birthdays. 2 speaking activities + 2 writing activities. Then the students can write the date on the board everyday at the beginning of the class. 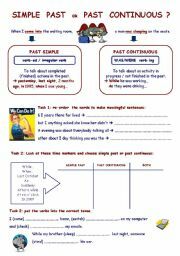 Simple past or past continuous ? They must find the different parts of a newspaper front-page. 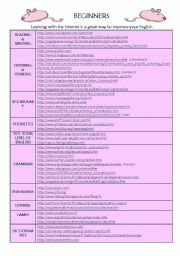 (Correction to be downloaded separately, sorry, it was too heavy : http://www.eslprintables.com/printable.asp?id=429278#thetop ). 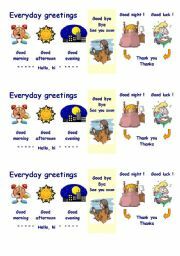 Greetings: vocabulary for beginners (x 3). 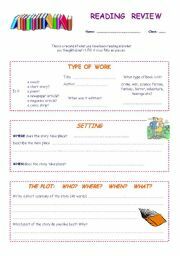 The students read the story / book / novel / comic strip ... and complete the worksheet (genre, setting, plot, characters, opinion). A poster for the classroom. US and GB celebrations. 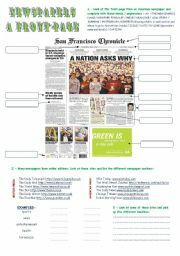 3 pages to use in the classroom. The students first discover and repeat the words, then try to memorize. "at the bottom, in the foreground, on either side, in the middle ..."